Andrew Buccilli will defend his Ph.D dissertation on “Search for Signatures of Large Extra Dimensions in High-Mass Diphoton Events from Proton-Proton Collisions at √s = 13 TeV with CMS”. A search is performed for a nonresonant excess of high-mass diphoton events over the Standard Model background prediction. Such an excess could be a signature of new physics, such as from the existence of extra spatial dimensions in the universe. The sample of diphoton events were produced in proton-proton collisions using the Large Hadron Collider at a center-of-mass energy of 13 TeV. 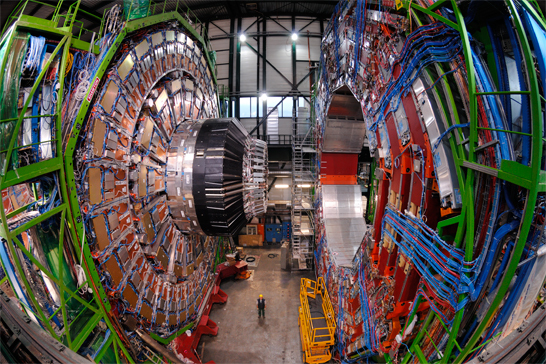 The data correspond to an integrated luminosity of 35.9 fb−1 and were recorded in 2016 with the CMS detector. Compared to Standard Model background sources, the data are consistent with the background-only hypothesis and the results are interpreted in the context of the large extra-dimensional model of Arkani-Hamed, Dimopoulos, and Dvali. This result provides the best model limits from searches in the diphoton channel and will be published in Ref. .